The hospital room door swung open with urgency, the usually polite charge nurse avoiding eye contact. “I’m sorry Mr. Ishii, but we put you on suicide watch,” she said with a slight vocal tremor while scurrying around the room collecting unnecessary cords, hoses, anything that I could use to hurt myself. The cogs of my mind lurched to a halt, and I felt the crushing of my soul, the contents leaking on to the floor and funneling into the drain. How did I get here? In May of 2018, I suffered a crash on an adventure motorcycle and tore the ACL, medial meniscus, lateral meniscus and patellar retinaculum in my left knee. 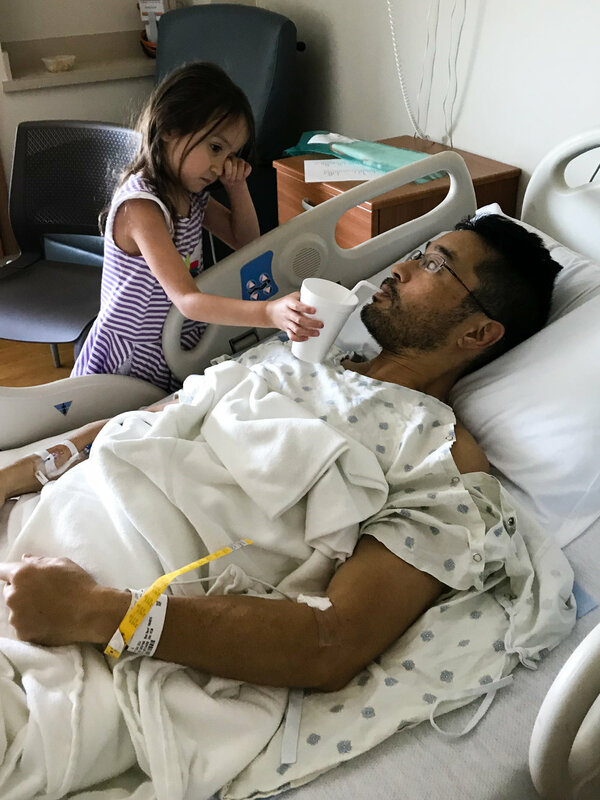 After initial denial (I was active for two weeks post-crash, testing kayaks in Colorado and hiking in the mountains), I accepted the need for surgery and the four to five months of downtime. I was content despite the crash being no fault of my own. At 49 years of age, and a lifetime of engaging in riskier outdoor endeavors, this was my first significant injury. The odds had finally caught up to me, and I felt fortunate that I had made it into middle age relatively unscathed. Physical therapy started three days post-surgery, and all indications pointed toward a quick recovery. The pain was staggering at times, but it all seemed part of the deal. Two weeks out, the already high level of pain spiked, and I started bleeding from the patellar tendon harvest wound. After some inconclusive tests, the surgeon ordered an exploratory procedure for the next day, Sunday, July the 1st. I was still calm, and again, feeling lucky even with this complication. I made it so long without a hitch so some snags could be expected to even the score. I expected my second knee surgery to be minor. “In and out in twenty minutes, we will see what’s up,” was the surgeon’s comment as I got wheeled into OR. I awoke two and a half hours later, in tremendous and debilitating pain. A nurse repeatedly apologized and told me to hold on a bit longer for the next allowable push of opioids, trying his best to engage in conversation to distract me from the evil inside my knee. I would later learn that I had a staph infection in my knee joint which required aggressive scraping to remove infected tissue and the pain was rated to be amongst the worse possible due to a surgical procedure. I had waltzed into the hospital in a T-shirt and shorts, expecting to go home the same day, just like the original ACL reconstruction procedure. I spent the next eighteen days split between two hospitals, much of it spent under the influence of the highest opiate dosage rate allowed. Nurses pushed Duladid through my IV or orally every other hour, combined with more pills than I could count. I had an IV antibiotic every eight hours and OxyContin every twelve. I stared at the ceiling and wasted away, my knee immobilized much of the time due to a thick scab that now covered the length of my patellar harvest wound, which the surgeon had to reopen. Even though I attended PT and OT sessions daily during the last half of the hospital stays, I lost over thirty pounds, and at one point couldn’t raise myself out of bed. I cried every morning and continually asked nobody in particular, “why?” Luckily, my wife and daughter were there 24/7. Otherwise, that period would have been unbearable. It was a joy to be released to the comfort of my own home; PT and recovery efforts ruled the following weeks. I did twelve or more hours of therapy per week and thought of almost nothing else. A staggering amount of appointments required my wife to drive an hour to and from town. She also had to do everything around the house, including feeding me and our daughter. I gradually improved, eventually able to wiggle into my truck and drive myself. After six weeks of IV antibiotics, two weeks of oral antibiotics, and two weeks of being infection-free, another procedure was required to remove scar tissue that was halting improvements in flexion. I rolled into surgery for the third time on September 13th, and it was arguably going to be the turning point in my progression. The roadblock to further mobility was about to be demolished. The debridement surgery was a success; I went from less than thirty degrees of passive knee flexion to over 100. As soon as I put my foot down, I could feel the enhanced mobility, and I was jumping out of my skin to get back to PT and advance quickly to working and outdoor life. The high hopes prevailed until the second day out. That evening, I became incredibly fatigued and was sitting in the living room, thinking about heading to bed much earlier than usual. My wife and daughter were reading a book, laughing and enjoying their close bond. I was only a few feet away, but I felt invisible. My post-surgical discomfort and fatigue had to be obvious I thought, but neither of them even raised an eyebrow as I struggled to get up. I hobbled to the bedroom, my presence and difficulties non-existent. I sat on the side of my bed, and the thoughts pierced my mind like a needle. “I have a gun in the truck and here’s a full bottle of Percocet,” I thought, and I was instantaneously scared out of my mind. I sobbed silently, laid down and stared out the window. As if on cue, my dog Pumpkin ran into the room and laid next to me, and I calmed down. When our daughter was busy in the bath, I told my wife. She took it peacefully and asked if the thoughts remained; they did not. She could see I was scared and acted just as she should have. She later hid my gun and only left the next dose of Percocet within my reach. Two days later, the bottom fell out. I awoke, my knee swollen, but assumed it was a normal reaction to the surgery and my therapy. But then the pain intensified to the worst I have ever felt, and a fever ensued; the surgeon ordered me to go to the emergency room. I knew the symptoms pointed to another infection, but I held a sincere belief that I had done too many exercises the day before. I couldn’t accept the infinitesimally small odds of another staph infection. The emergency room staff admitted me into the same room I had during the initial infection. A nurse explained that my circumstances and industry data pointed me out as a hospital suicide risk. She was required to ask only a handful of questions, and I was honest with my replies. The staff took no further action. It just happened to be National Suicide Prevention Week. The next afternoon, I heard a nurse say “wash out” on her phone, and my heart fell into my stomach and again, my soul deflated. I screamed “no” loud enough to startle a few staffers, and I felt all the energy leave my body. In that instant, something left me; some part of my makeup permanently vanished when I heard those words. That piece of me is still gone today. To no surprise, I was scheduled to have two wash out procedures within four days and would again have to endure six weeks of IV antibiotics. I was shattered, lost all faith, and had nothing left. I was so devoid of energy that I didn’t cry. The overwhelming thoughts and feelings centered around disbelief. My knee felt much improved after the first washout procedure, but there I was again, laying in the same hospital room as after the original infection, with the same nurses. They all recognized me, and I could sense their sympathy for me and our mutual disbelief of the impossible odds. That night I had a vivid and utterly realistic dream. I had gray hair, and I was walking in an alpine town. I was haggard but happy, having just descended from a successful climb. I still had my gear and backpack on, strolling down narrow stone walkways and suddenly my left knee started hurting, the pain and swelling mimicking the events of the past few days. I cried out the same “no” as I did in the hospital and I knew I couldn’t bear what was to come. I slowed my walk, devolved into a crawl and morphed into an emaciated dog struggling to find a place to curl up and die. People ignored me, and I was filled with the same sadness I had when I thought my family couldn’t see me. I woke up, and without any conscious direction, saw a traction anchor in the ceiling that would hold my body weight and plenty of extension cords and knew I could end my life. I could not absorb and process the thought that the infection could recur in the future at any time. I was terrified, woke my wife up, and told her what had just transpired. She again remained calm but pleaded that my daughter, who was sleeping in the room, needed me. That simple statement snapped me into the present; I harnessed my emotions, calmed down, and eventually went back to sleep. The next morning, a nurse, per usual, asked me if I had suicidal thoughts, and I told her the events of the night. She didn’t show any emotions as she took my vital signs, and left the room. A few minutes later, the startling all-hands-on-deck reaction started, and the hospital enacted the official suicide watch. I was shocked and angry; I felt all of it was an overreaction, steadfast that my wife and I had it under control. The actions of the staff were more stressful at the moment than my suicidal thoughts. Ironically, a constant stream of friends visited afterward, unaware of the suicide watch until they came into the room. I explained the situation, and I never felt judged. These faithful friends kept me from projecting into the future, and I realized how incredible my life had been and still was. I was still a little rattled mentally, but the darkness and doom I felt about the future vanished while they were there. The visitations continued almost non-stop for the remainder of my hospital stay, a gift I still think about today. That afternoon, I had to excuse a visiting friend and my family to have a psychiatric evaluation performed remotely. A nurse wheeled a “medical robot,” a wireless rack of computer components, speakers, microphones, and cameras into my room. For the first time during the suicide watch, I was “alone.” The psychologist appeared on screen, and in a calm demeanor asked me deep questions, and I openly answered. He termed my terrifying visions as “intrusive thoughts,” and as long as these didn’t align with my conscious desires, he didn’t think I was a suicide threat. He ended the 45-minute conversation with “you have and will always be awarded for your ability to be candid.” That stuck with me; that’s why I could tell my wife the things stirring inside my head instead of hide them. That’s why I didn’t feel any embarrassment telling the nurses the same. It didn’t occur to me until later that others can struggle being open, withholding these thoughts and feelings, precluding an adverse outcome. I had my second washout procedure on my fifth day of the hospital stay, and everyone hustled to discharge me the same day, knowing I was mentally better off at home. As of this writing, I am nineteen weeks out of my original ACL surgery and six weeks out of the suicide watch. I have consulted a psychologist friend of mine a few times, and am predominantly in good spirits. I occasionally have negative intrusive thoughts, but they don’t seem as “real,” and I don’t find them startling. I can let them go quickly and get on with the business of getting better. I was the last person I ever thought would succumb to suicidal thoughts. Plenty of acquaintances have taken their lives, and from the outside, those losses of life seemed out of balance with the positives I perceived existed for those people. A college roommate took his life; I knew he had a dark side to his personality, deep and brooding. After a failed relationship, he embarked on a climbing “trip of a lifetime,” and so it was. I think about him occasionally and reminisce about the happy times we had together. The massive differences in our personalities seemed to exempt me of his troubles and ultimate suicide. I could never imagine, even after all the deaths in the small circles around me, that I would find myself in a similar position. But now I know. And in my opinion, it can happen to anyone. I reached a psychological breaking point that caused a drop in mental discipline. Negative intrusive thoughts slipped through the cracks, and because I consciously didn’t desire to end my life, they scared me into actions that helped me. In my brief time in this space, I comprehend how an invasive idea of how to end one’s life is an answer to the conscious desire to do so, and I can feel, to my core, how anyone could take their life. Every one of us has a psychological breaking point; intrusive thoughts may prevail. My sincere advice is to tell someone, anyone. A good human will not judge you. A good human will listen, and although they may not truly understand, they will help. We are all in this together and we need you on the team.